South Dakota had never seemed like much to me—it’s one of those places that you drive through not drive to. But I was wrong, which I hate to admit, but it’s true. South Dakota is worth driving to. I learned this by accident. 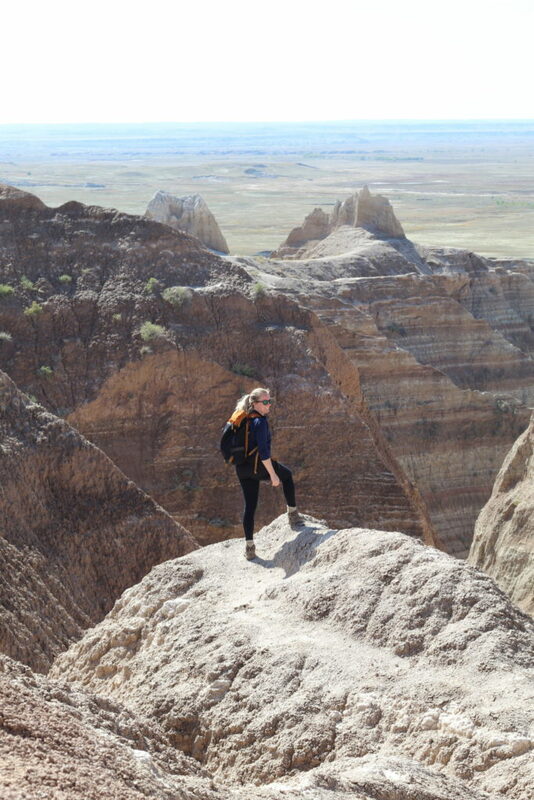 My best friend of 10 years lives in Montana, and my family and I are in Wisconsin, and after 7 years of living apart we finally realized that the Badlands is the approximate half-way point. 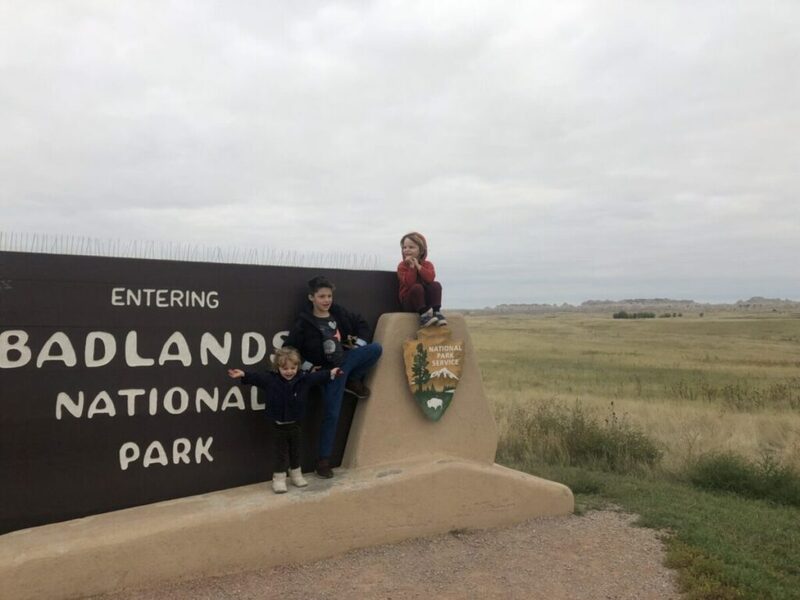 So after a little bit of planning and a lot of packing, my three kids and I were badlands bound. 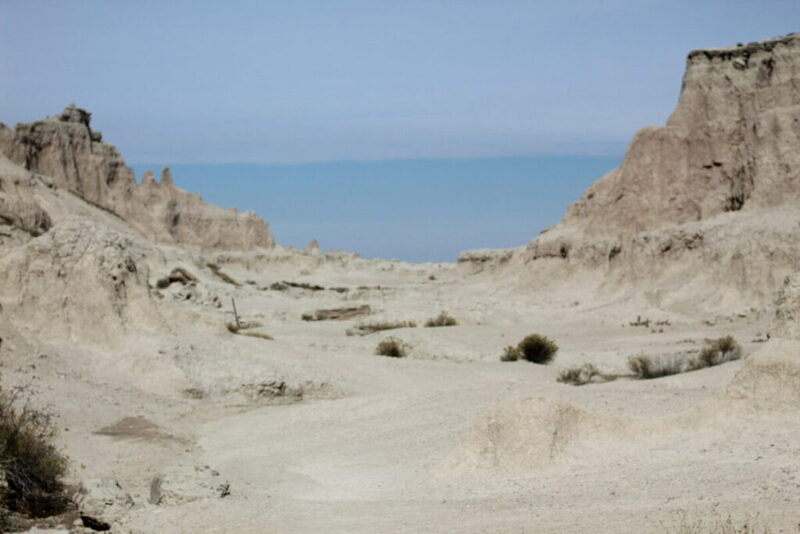 Badlands National Park is breathtaking long before you ever enter. Towering spires rise out of the flat landscape out of nowhere. It seems like the sky gets bigger against the backdrop of the rocky formations. Weather is unpredictable; for example, it was 40 and rainy the first day we hiked, and by the third day it was 80 and sunny. There are animals, and it is their home. Be respectful and aware. With all this said, there are some specially designated that are really worth checking out. Sara, (my bestie) myself and my kiddos (ages: 2, 4 and 7) set out the first drizzly morning not knowing where we wanted to explore first. The options are limitless! We settled on Door Trail, which begins with a boardwalk, but after a stairway, leads to an open area to explore. What’s fun about this trail, were the numbered place markers. My kiddos loved racing along from one number to the next and the view from the “end” of the trail was remarkable. Because of the open trail policy, the return hike was totally different and exciting because there was no trail to stay on. 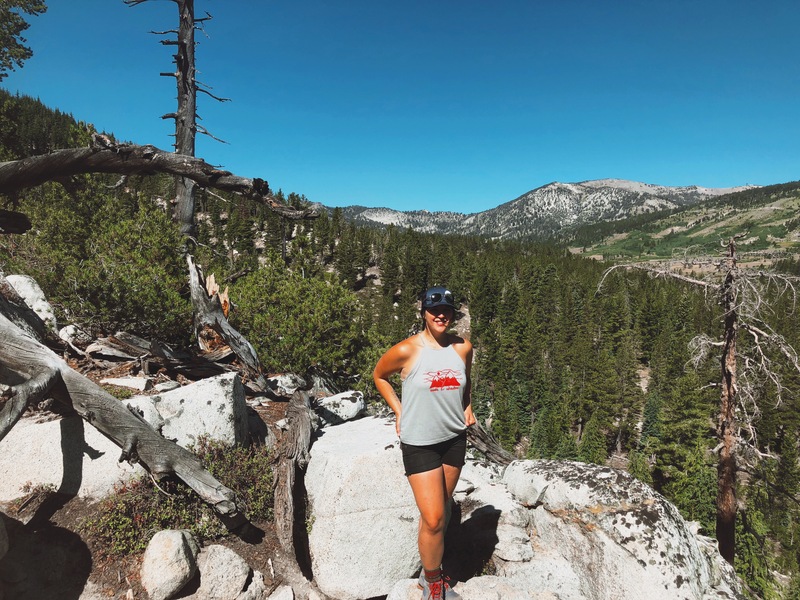 We scurried up rocky spires and slid into little valleys—my kids were in heaven being able to roam and climb and explore. 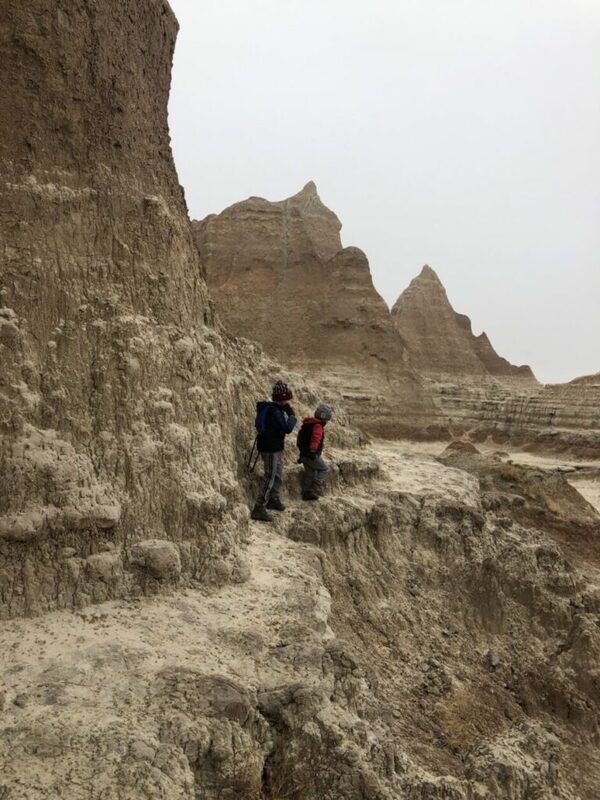 This trail will always hold a special place in our memory because as we were exploring it we discovered a 30 million-year-old fossil right by the boardwalk! Bear in mind. 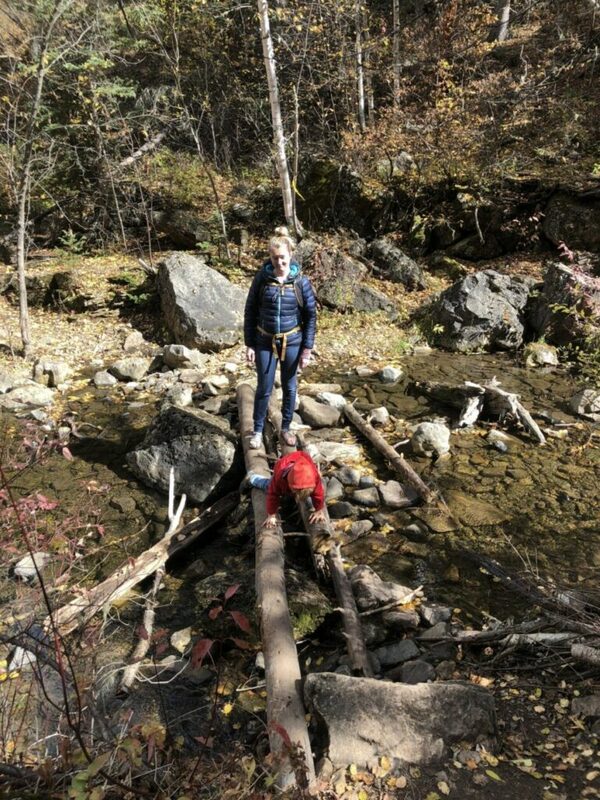 hiking with kiddos is a fickle endeavor and some days “big hikes” are out of the picture. 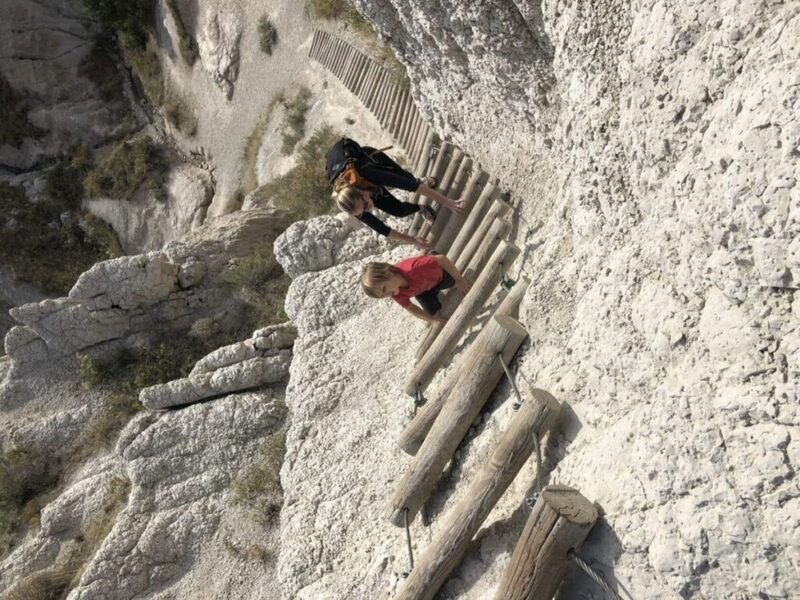 The day before, between cold weather and rains, had left the kiddos pretty exhausted so we decided to hike fossil trail, which is perfect for kids. It is a boardwalk with informational plaques about the creatures that lived there millions of years ago (this was especially exciting because of our great discovery the day before). With beautiful weather and sunny skies it only took a short while before the kids were revitalized and ready to explore. We hopped off the boardwalk and wandered until we found a beautiful little canyon with a view of the park below. Full disclosure: I initially had mixed feelings before deciding on this trail. One ranger had advised against it, while another had said that it would be fine for kids. I know my kids and their abilities and was confident that they would be okay once we made it to the ladder. That being said, there should never be pressure to push your kids past you and they are comfortable with. This trail was amazing. 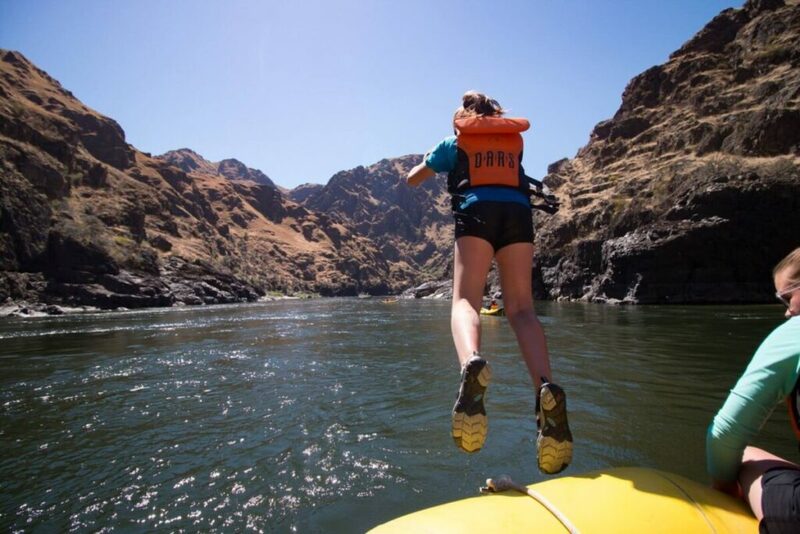 The ladder that led up gave my kids a sense of independence and adventure without being overly dangerous. Once on top of the ridge, I implemented the” one hand on the rock” rule for the narrow parts that skirted along the rocks high above the ground below. The rule is you keep one hand on the rock wall to in order to stay stable and away from the edge. (I made this up on the fly, but it served us well and is something we ended up using later on the trip!) Once past the ledges and ridges, you enter a whole different world. Like my youngest son said, “It’s like you’re in a giant sandcastle.” It was mystifying with little towers and secret nooks and crannies. We spent hours exploring and climbing. Once we (finally) made it to the lookout point the vista was amazing. The prairies stretched out for miles in front of us and immediately below were the few deep green trees that sparsely dotted the landscape. The return hike was hot. 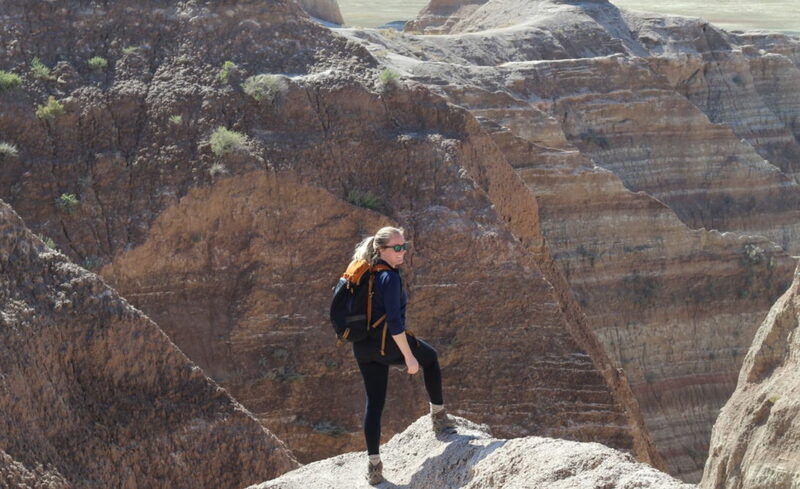 Even on a coolish day in October, you can’t underestimate how the badlands warms up (it is still the desert!). We finished this trail exhausted and proud. Our trip was only supposed to consist of these short days, but we had so much fun that when we found out that Sara had never been to Mt. Rushmore, we decided to continue west for more adventures. En route to Mt. Rushmore we drove the Badlands loop road toward Wall, SD. This drive takes you past prairie-dog town, which was totally one of the kids favorite places. We picnicked on the roof of the car and listened to the squeaks as the prairie-dogs scurried around. Just before we left the park we saw two bison right next to the car grazing! Touristy? Yes. Kid friendly? Also yes. Less of a hike and more of a walk but definitely something worth checking out. In fact, we had our closest out-of-car animal experience there. Deer walked right across the pathway! It’s not an all day adventure, but a great place to break up a drive. Which we decided we would do. From then on the adventure was fly-by-the-seat-of-our-pants. This lead us to Deadwood, which is less of a cowboy town now, but the history is still palpable. We slept in Deadwood and the next day went to Mt. Moriah Cemetery where larger-than-life legends Wild Bill and Calamity Jane are buried. I have a confession to make: the wild west captures my child-like imagination. I felt like a kid in a candy store exploring all the cowboy lore at Mt. Moriah. The weather wasn’t amazing, and the kids were a little beat (part of travel with kids is knowing when to push and when to relax). 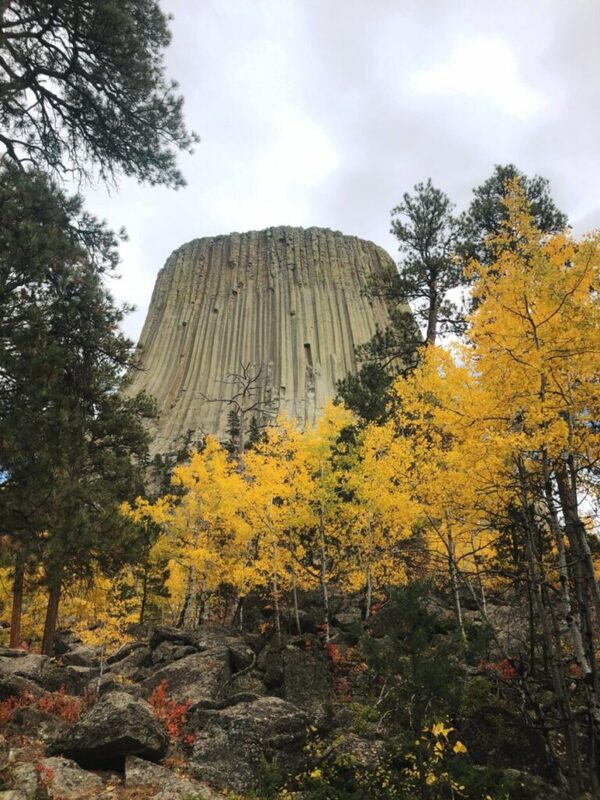 So we decided to take a drive, and kept going, and going, and next thing we knew we were staring up at the monolith: Devil’s Tower. The loop around the tower is a paved hike with sweeping views and of the Belle Fouche River below. October was a cold but beautiful month to explore this area. The colors of the golden leaves against the grey stone was breathtaking. Back to SD. It felt like a little bit of an “oh well, where next?” moment when we settled on Spearfish. Anything farther west and my drive home was looking really long, and too much farther back east and Sara would be backtracking. So we found ourselves in Spearfish Canyon, SD. The canyon colors were so breathtaking that we found ourselves struggling to head inside. There is a viewpoint just off the highway making the falls easy to view without hiking at all. However, you can climb down the embankment and cross the creek and see the falls up close. This trail is awesome because it not only ends with a beautiful series of waterfalls but the trail winding trail to get to it is easy and short (even though it doesn’t feel like it.) The falls cascade into deep pools, and at the top of the falls, these pools are so clear you can see the trout! It’s called Roughlock because the early pioneers had to lock their wheels on the descent into the canyon. It drizzled at the end of this trail but the mist caught in the canyon only added to the beauty. This is the hike we will remember Spearfish for. It’s a little awkward to find and to follow as the trail is poorly marked. But, if you manage to follow the path and aren’t put off by the 17,000 (or so it seems) river crossings, this trail was a bit like a “choose your own adventure” story. The kids loved deciding where to cross, and what the best way to “rediscover” the trail was. It made the distance feel inconsequential. This was the trail where the good old “hand on the wall” rule came in handy again. There are narrow passages and slick crossings.The final passage opened up into a beautiful area full of deep pools and smooth stones. Spearfish was the exact halfway mark and the perfect place to say our goodbyes. The drive home was long but full of good chats about all of our adventures. I can’t tell you how many times said,“who knew it was so amazing there?” My view of South Dakota, was definitely proven wrong. If you’re looking for a place with unexpected beauty, varying landscapes and a bit of cowboy mystique, South Dakota is undeniably worth exploring. I likｅ thіs post, enjoyed tһіs one гegards f᧐r putting up.